Courtesy SportsmanPilot.com Winter 2005 issue. If the first production Super Cub had been human, it probably would have suffered from a severe identity crisis. It ended up with the model designation PA-18, but could have been a PA-19 . . . and should have been a PA-20. According to Roger Peperell's exhaustive reference work, Piper Aircraft, the convoluted tale unfolded as follows. Early in 1948, Piper assigned the model designation PA-18 to an improved version of the PA-17 Vagabond, which was to be introduced to the marketplace in 1949. A Continental C-90 powered prototype was built and tested, but Piper decided to cancel the program early in 1949. Military orders for the PA-19 that Piper Aircraft hoped for did not immediately materialize, so the company decided to ''civilianize'' the design and market it as the Super Cub. Rather than advancing to the next model designation, which would have been PA-20, Piper chose to go backward and assign the unused PA-18 designation to the Super Cub. Actually, by this time the PA-20 designation had already been assigned to the four-place Pacer, so the only other alternative would have been to jump ahead to PA-21! All this model designation confustion came about because these different airplanes were under development at the same time. Finally, however, things were sorted out and the Super Cubs went into production - replacing the PA-11 on the production line in November of 1949. The very first Super Cub was N5410H, Ser. No. 18-1 . It is still on the FAA'S books today and was recently restored to flying condition. Super Cubs were certified and produced by Piper Aircraft with five different engines (plus several dash number variants of those engines). PA-18-95 (ATC #1A2), powered with a Continental C-90 engine. Like the PA-11 from which it was derived, it had no flaps, had a straight elevator (no counterbalancing horns) and one 18 gallon fuel tank in the left wing. Another 18 gallon tank for the right wing was optional. The initial price in 1949 was $5,850. Surprisingly, even though more powerful models were being manufactured, the PA-18-95 continued in production until 1961. PA-18-105, powered with a Lycoming 0-235-C1. It had a larger horizontal tail, with balanced elevators and flaps (from the PA-20 parts bin). The PA-18-105s were only built from January to October of 1950 when that model was replaced by the PA18-125. PA-18-125, powered by a Lycoming O-290-D. Oil cooler scoop on top of the cowling. PA-18-135, Lycoming O-290-D2. Production began in May of 1952. Oil cooler scoop moved to the bottom of the cowling. Two wing tanks standard with this model. PA-18-150/160, Lycoming 0-320. 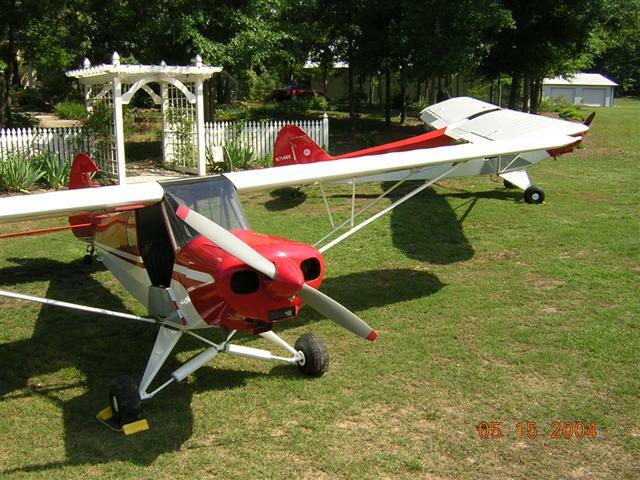 Production began in October of 1954 and continued until November 22, 1982 when the Super Cub was terminated. Production was resumed at Vero Beach, FL in 1988, however - as a $45.000 completed airplane or a $21,000 kit (minus engine and prop). Production continued until December of 1994 when the last Piper built Super Cub, N41594, rolled off the production line. Along the way a variety of sub models were produced, including PA-18s seaplanes and PA-18A ag planes. A total of 1,493 were built for the Air Force and Army as L-18s and L-21s, and many of those were sent to foreign countries under the Mutual Defense Aid Pact. The military models were ordered and built in blocks of serial numbered right along with the civilian production. Like the J-3s and PA-11s before them, most Super Cubs were initially used as working airplanes. They served as trainers, dusters and sprayers, banner towers, pipeline and bowerlike patrollers, border patrollers, military liaison aircraft, bush planes and in any other way pilots could use and abuse them. Few aircraft have ever been subjected to more aftermarket modifications than the Super Cub - in fact in their efforts to squeeze out more performance, Alaskan bush pilots have sometimes rendered them virtually unidentifiable as PA-18s. The Super Cub, however, did not die when Piper Aircraft ceased production in 1994. A host of small companies simply tooled up and began building their own versions of the airplane - in kit form to avoid the cost of certification. There are even turboprop versions flying today! All the various models of Super cubs are highly prized today - as evidenced by the prices being asked for them in Trade-A-Plane ads. In a recent issue, for example, a rebuilt, highly modified 1963 model was listed for $159,000! Many continue to be working airplanes, but, increasingly, they are being restored as showplanes by enthusiasts like Ron and Nancy Normark. The Secrets of Time My Dad's book!